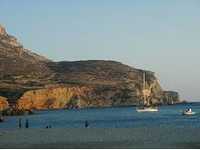 Folegandros is a beautiful small island and is well known for its unspoiled nature. It is a unique and untouched part of Greece. The Island hasn�t been affected by modern-day overdevelopment and has been protected from mass tourism. This atmosphere surrounds the entire Island and provides the most powerful ingredient of its attraction. The Island hasn�t been affected by modern-day overdevelopment and has been protected from mass tourism. This atmosphere surrounds the entire Island and provides the most powerful ingredient of its attraction. There are 3 main villages on the island, Karavostassis which is also the main port, Chora which is the capital and Ano Meria. The island has beautiful beaches, spectacular sunsets, dramatic scenery of the beautiful barren landscape, white painted cubic houses and churches built on the hills against the blue coloured sky and the sea all around the island and the warm, friendly Greek hospitality make a beautiful Greek scene. The Island is ideal for those seeking genuine Greek Island life. There are 2 caves on the island, Faraggi and Chryssospilia (Golden Cave). According to the locals they are interconnected. They can be both visited on foot although Chryssospilia is easier to access by small boat. The relatively small Island (32 square miles) of Folegandros is located at the southwest point of the Cyclades between Sikinos and Milos. 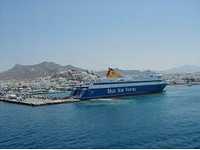 It is 102 nautical miles from Piraeus (The port of Athens) and the travel time can be anywhere between 3,5 to 9 hours, depending on both the type of ferry and the route it sails. Visitors should be advised that accomodation is limited and bookings often need to be made in advance, especially during high season which is from 15 July - 20 August. The capital town of the island, Folegandros or Chora, is situated at a distance less than 3,5 kilometers northwestern to the port, at an altitude of some 200 meters higher than the sea level, at the rim of a steep cliff facing the sea. The view from Chora is breathtaking and limitless, offering the ideal scenery for photos, either from the end of �Pounta�, or from the church of Pantanassa within the castle, or from the balconies and the terraces of the buildings. Karavostassis is the port of Folegandros. A tranquil place, ideal for swimming and relaxation. the main beach of Karavostassis is called Hohlidia, a family beach, while there are several small secluded beaches nearby.